Imagine pulling up to a sporting event, a popular concert, or another event that you have been looking forward to and stepping out of a glamorous limousine. Heads will turn as you move to the front of the line and exit in the comfort and luxury of a sophisticated stretch limo. Now consider doing the exact same thing except with all of your friends, family, or neighbors along for the ride. That’s exactly the kind of experience you can expect when you book a bus charter in Fort Lauderdale with FloridaTours.com. At some point in their life, just about everybody dreams about being rich and famous. Being recognized wherever you go, having people clamor for your attention, or just walking around in the confidence that you are the most important person in the room are something just about all of us fantasize about. But now you can experience the real thing when you charter a modern, luxurious motor coach from FloridaTours.com for your next group outing. When everybody else is still stuck in traffic or parking their car in a crowded parking lot, you can be stepping out of a shiny, sophisticated motorcoach right at the front of the line. When you choose FloridaTours.com for your next charter bus in Fort Lauderdale, you and everybody in your group are instantly transformed into VIPs. First impressions matter. 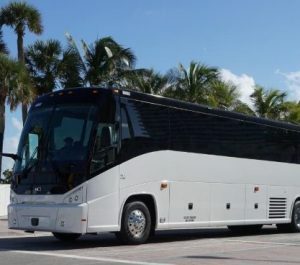 So if you want to make a big first impression as you arrive at your next group outing, you can do it with a bus charter in Fort Lauderdale from FloridaTours.com. When other people see your group pulling up in one of our luxurious tour buses, everybody will be buzzing and wondering who you are. Be the hero of your next story. Charter a bus for your next group outing with FloridaTours.com.